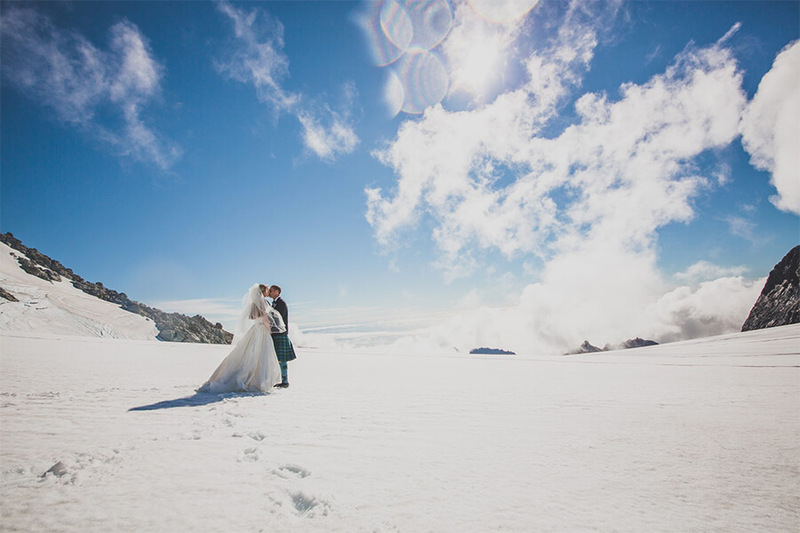 A wedding at Fiordland Lodge is the event of a lifetime. 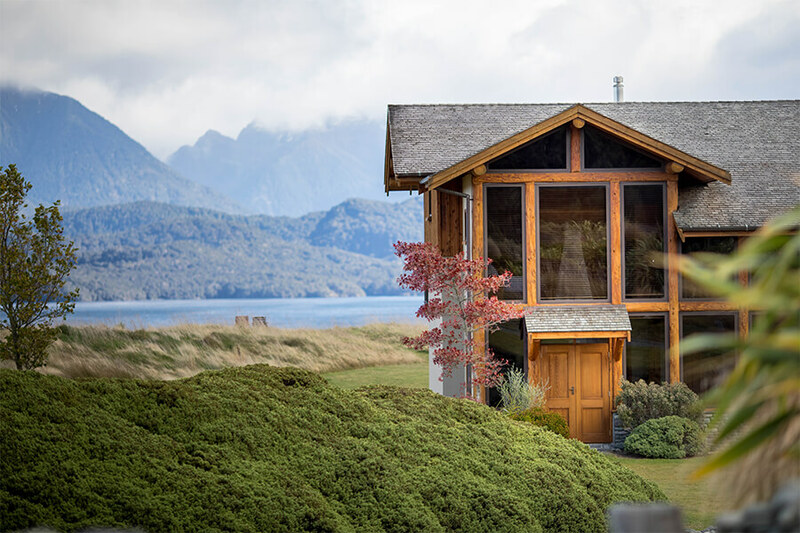 The Main Lodge is remarkable, offering the finest accommodations and dining in a truly idyllic setting on the edge of Lake Te Anau near Queenstown. 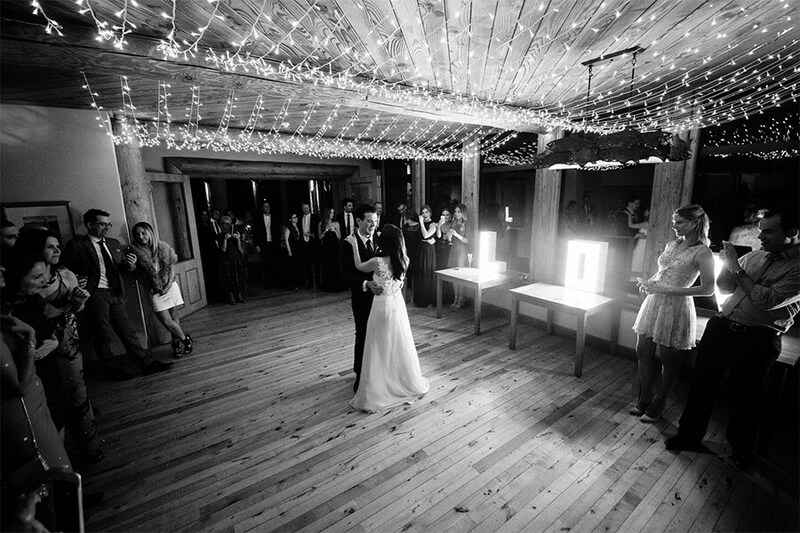 The romantic nature of the Lodge truly shines at a wedding. The rooms spill over with music, firelight, dancing and flowers. The Ceremony....all afternoon weddings of 15 people and more must reserve the entire property and the possibilities for ceremony venues are limited only by your imagination. 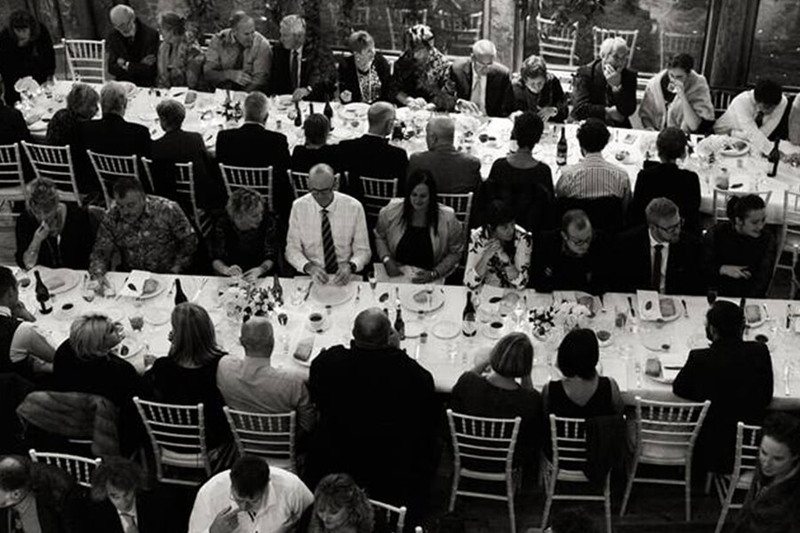 Should your numbers be 30 or less and you would like a lunch time wedding we do offer an excellent incentive rate for daytime weddings where our main restaurant is available as a private room from between 10.30am-5pm. 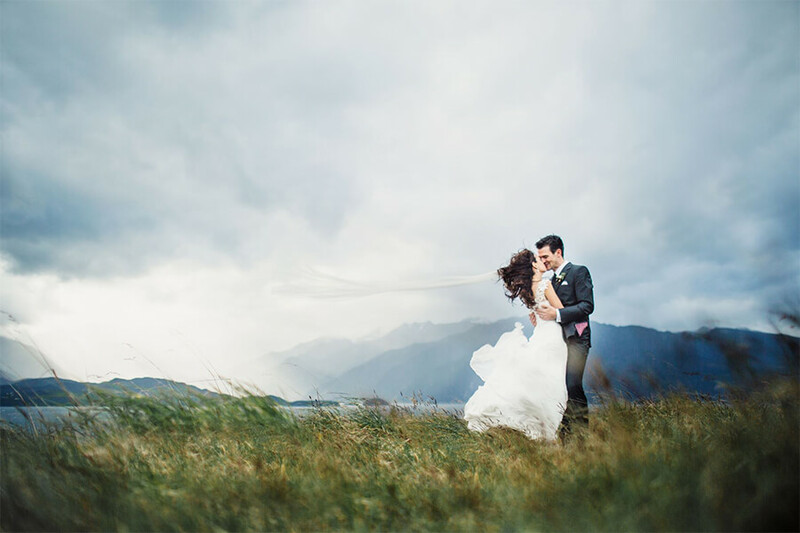 The Lodge bridal lawn has spectacular lake and mountain views and acts as a glorious backdrop with the blue lapping waters of Lake Te Anau. 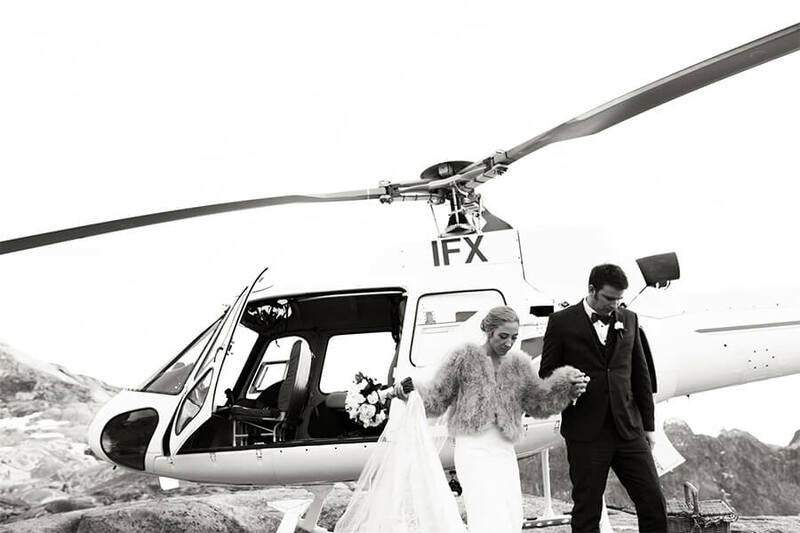 This is a magnificent and unique location to exchange vows. 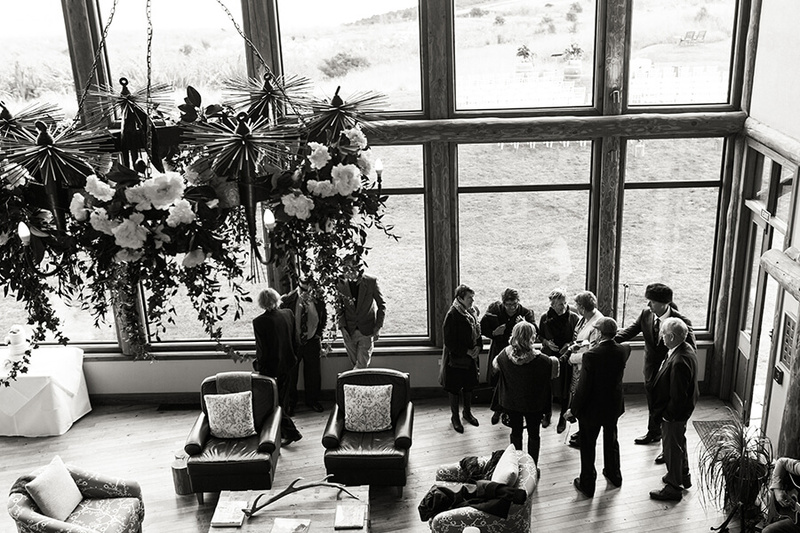 Inside the Lodge the Great Room also has stunning, unobstructed views and can accommodate 100 seated guests. Flanked by huge 30 feet stone fireplaces this is an ideal room for the ceremony and acts as an excellent alternative should the weather be chilly. 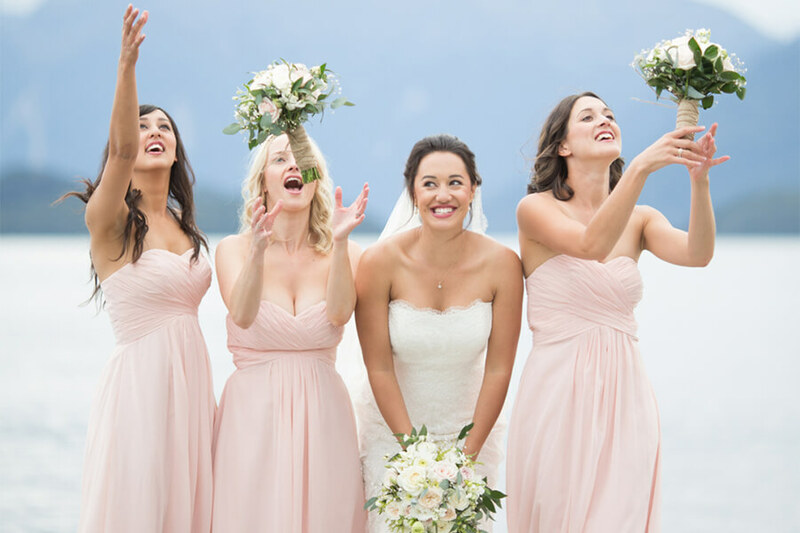 The Reception can be a wild, joyous celebration or a quiet one, as you wish. 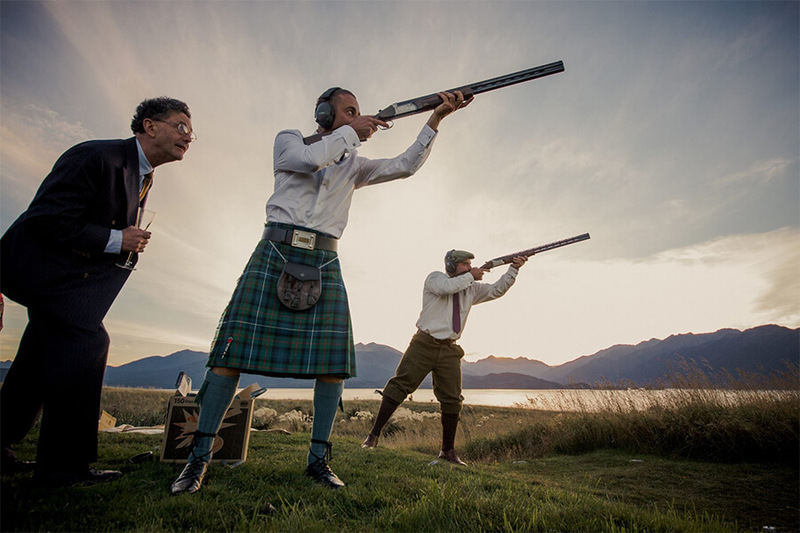 Set in a World Heritage Area, Fiordland Lodge sets the scene for a day to remember; the authentic atmosphere of the lodge, the extraordinary service and the very fine cuisine make it an exceptional occasion. 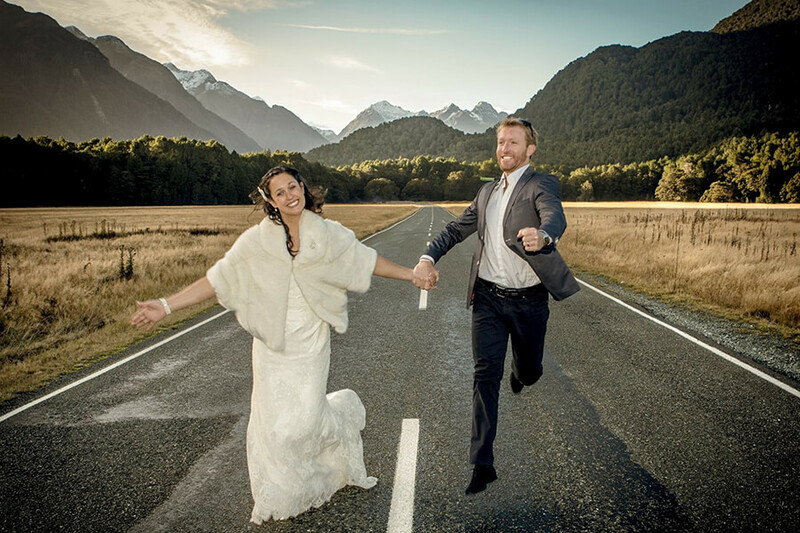 Photo opportunities in and around Fiordland Lodge are endless. 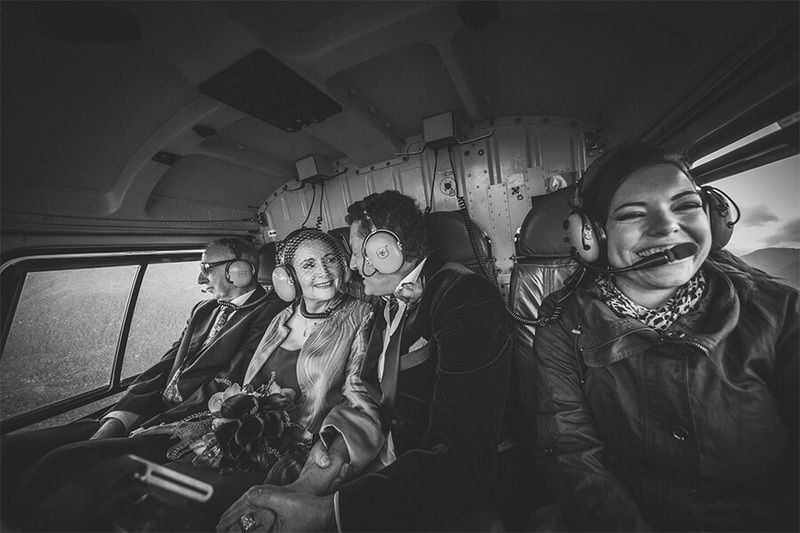 Unique to Fiordland Lodge, Helicopters can land directly in front of the Lodge and within minutes you can be having your wedding photos on snow-capped mountains in an ever-changing scenery of alpine lakes, waterfalls and hanging valleys. 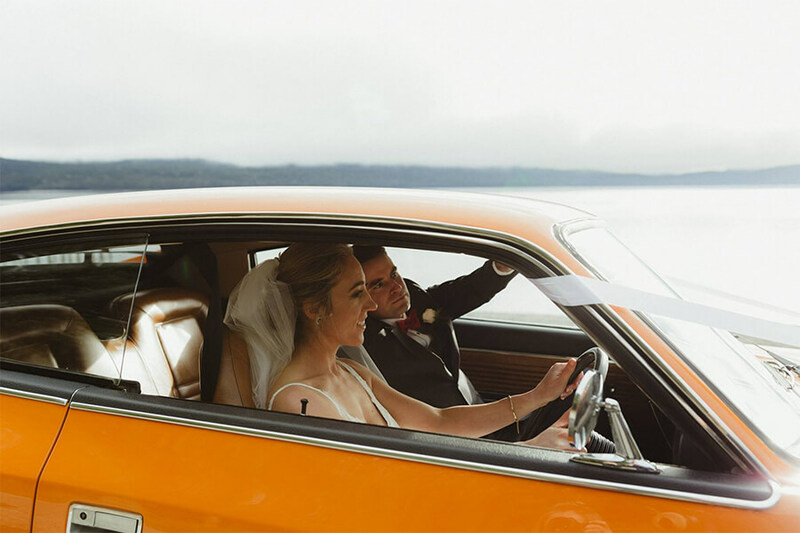 Should your numbers be 30 or less holding your wedding followed by a lunchtime reception at Fiordland Lodge is a clever way of making the most of your special day. 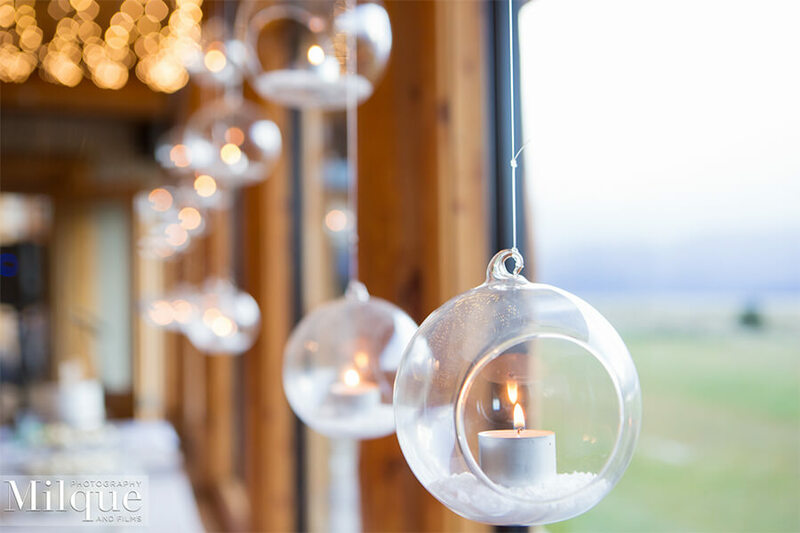 Lunchtime receptions can also end up having a more relaxed atmosphere but still incorporate all the elements that make a night-time reception so enjoyable. 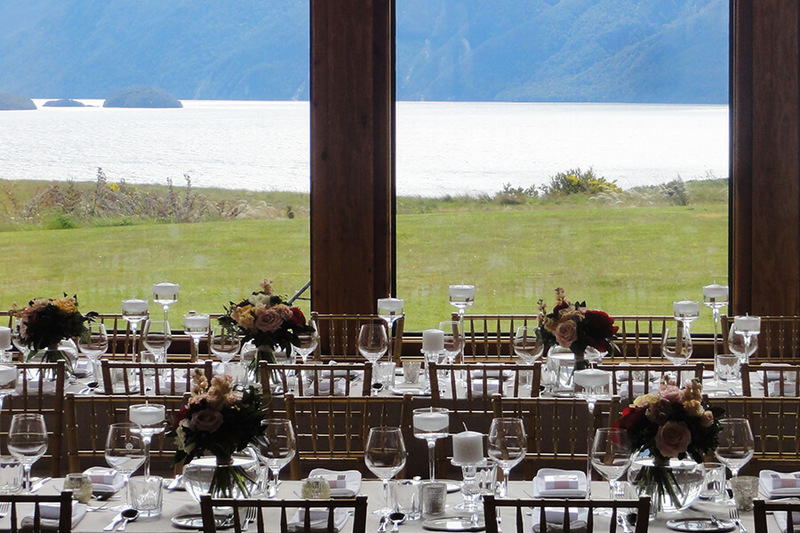 Fiordland Lodge offers an excellent incentive rate for daytime weddings where our main restaurant is available as a private room from between 10.30am - 5pm. 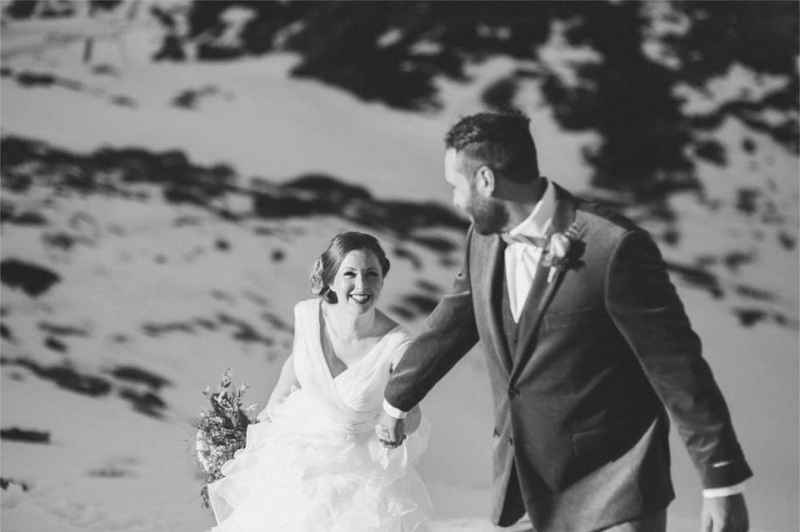 You will be able to host your wedding at the lodge over peak season, so this means it’s often easier to lock in your preferred date. 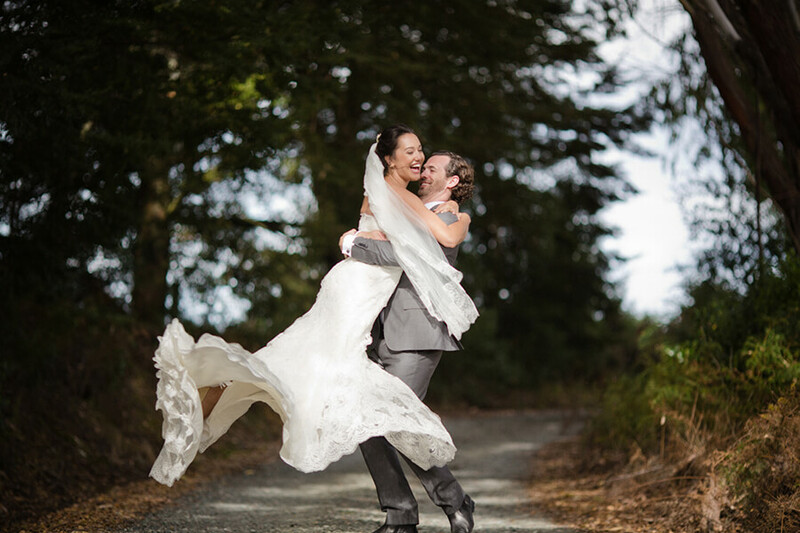 Price - we offer a special venue rate of $2,500 for all day time weddings. 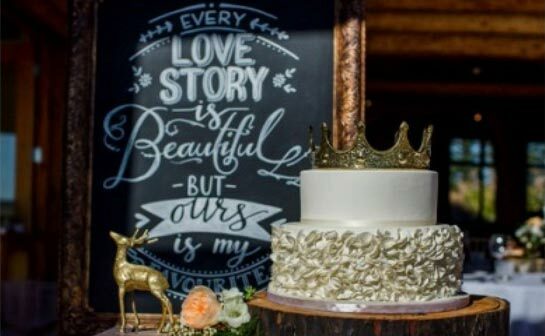 All day time weddings still get to choose from the same menus. Skip the decorations – lunch affairs are thought to take on a more casual approach, so you can save money on the likes of bands, cars and flowers e.g. more simple centrepieces. 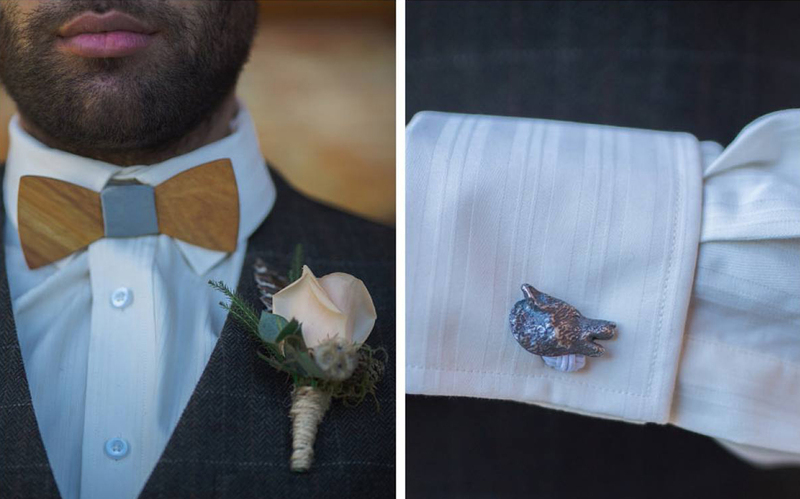 You get the photos all day - more hours of daylight mean more opportunity to take great photographs of you and the wedding party. Family Friendly - ideal for kids and elderly as it does not get to late for them and even if you have a babysitter you won’t need to rush back. Enjoy the views the entire time. 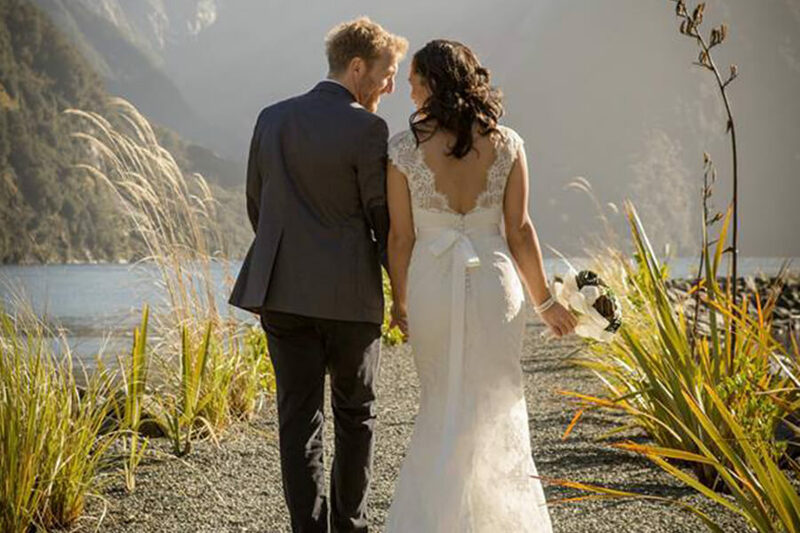 If you're looking for a luxurious, private and intimate wedding ceremony and reception venue, Fiordland Lodge is perfect. An exclusive retreat with only 12 rooms, we accommodate up to 29 overnight but can cater for up to 120 day guests, ensuring a truly amazing atmosphere. 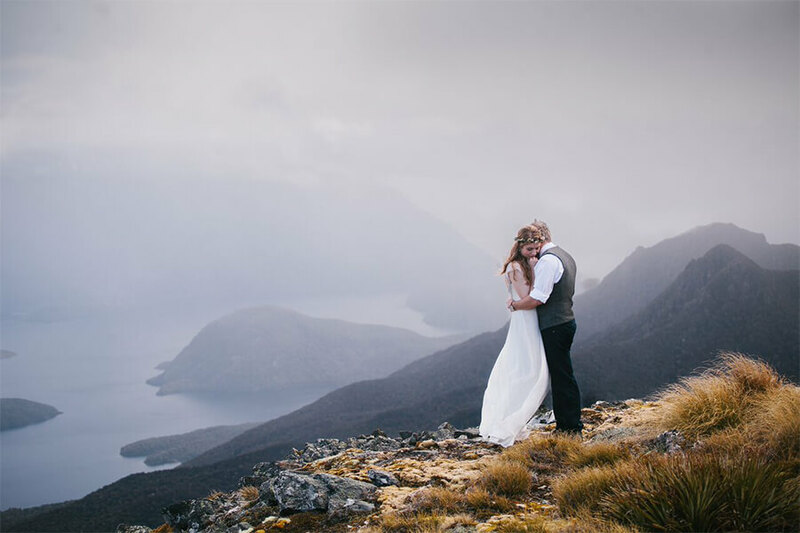 Fiordland Lodge is set on the crest of a hill and offers expansive views over the World Heritage Listed Fiordland National Park "It is a stunning venue for your special day", couples can hold their wedding ceremony anywhere on the property. 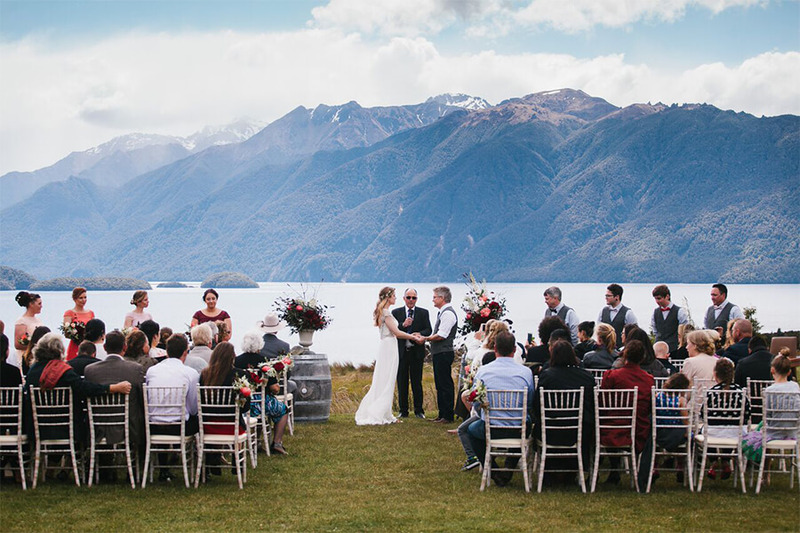 Fiordland Lodge has stunning, unobstructed views of Lake Te Anau and Murchison and Kepler Mountains and can accommodate 120 seated guests on the front lawn. 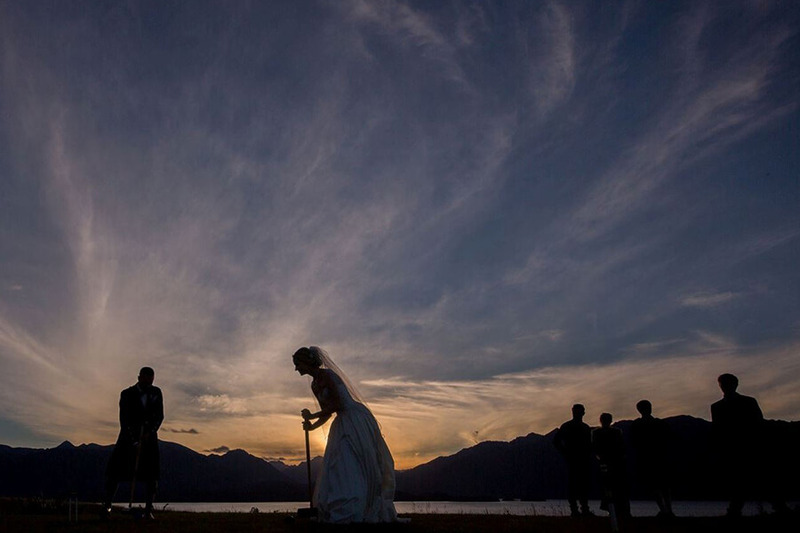 This is a magnificent and unique location just near to Queenstown to exchange vows. 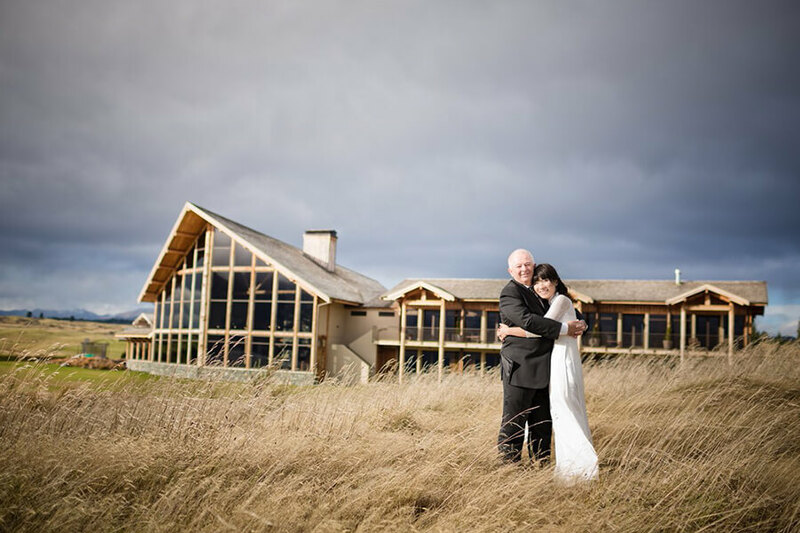 Fiordland Lodges Great Room also has spectacular lake and mountain views and is anchored by a massive stone fireplace, vows can be exchanged here as a wet weather alternative while the bride and groom are encircled by family and friends. 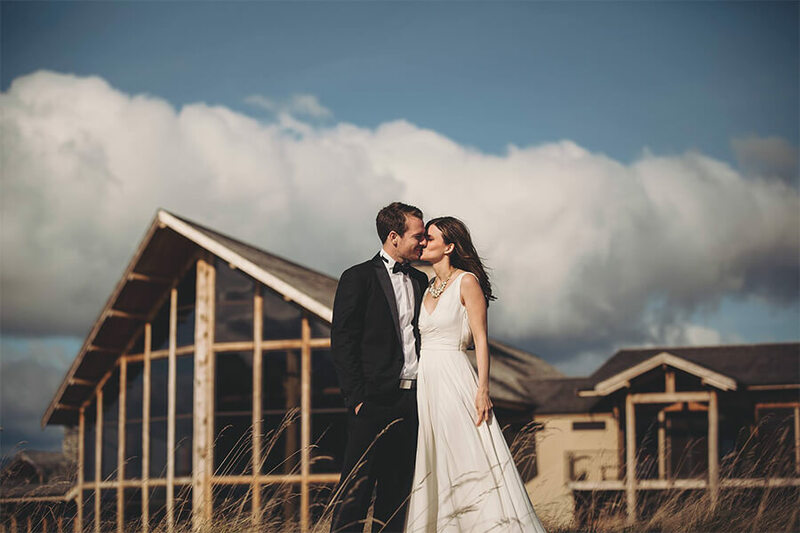 Set in a beautiful natural setting, perfect for exchanging vows and taking wedding photos, Fiordland Lodge is an-inspired venue ideal for an intimate reception. 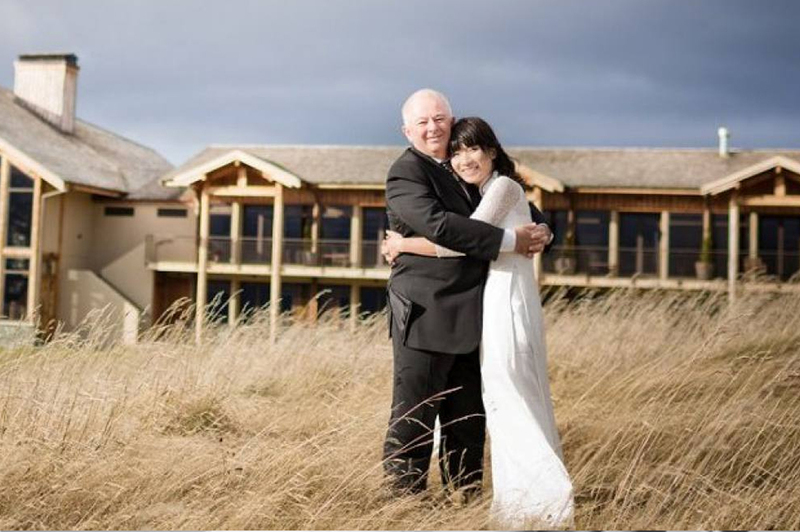 Best of all, the lodge offers exclusivity for your wedding and the opportunity to have guests stay on-site in the in-house rooms. 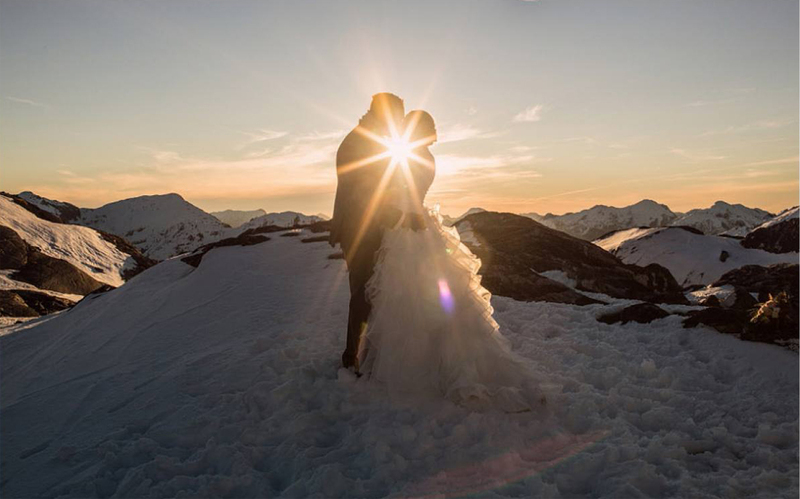 Immediately following your ceremony, photo opportunities are endless and you can actually fly directly off the lawn and within 5 minutes be having your wedding photos taken on snow-capped mountain ranges. 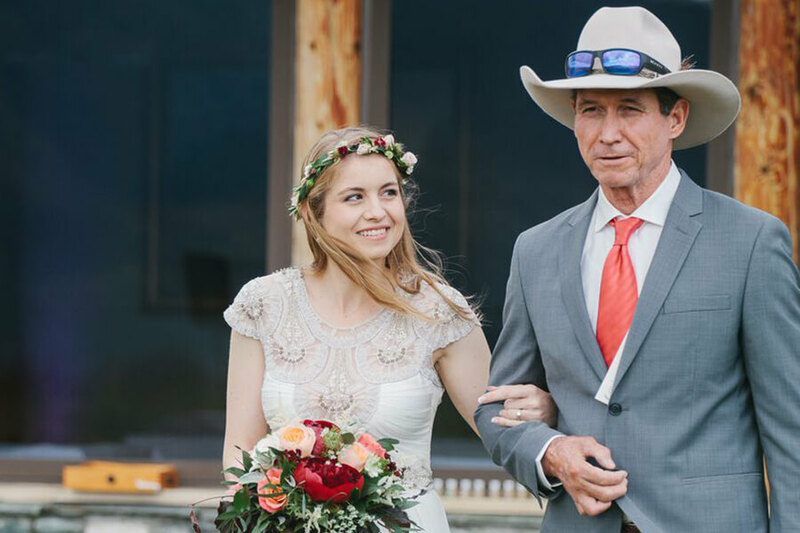 Of course you have reserved the entire property so the possibilities for ceremony venues and photos are limited only by your imagination. 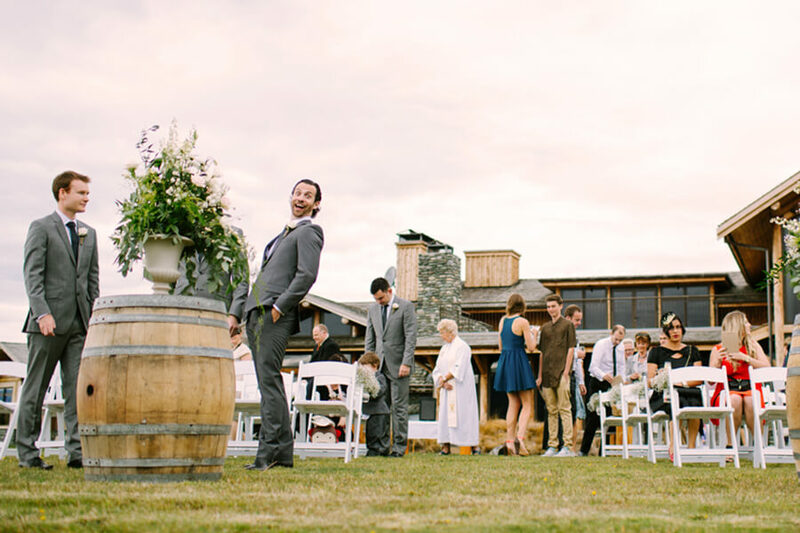 The reception can be a wild, joyous celebration or a quiet one, as you wish. 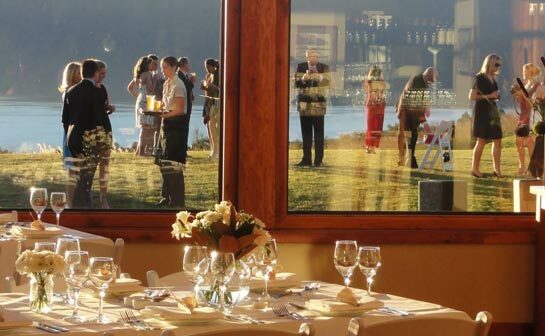 Lake Te Anau and the backdrop of the Fiordland National Park set the scene; the authentic atmosphere of Fiordland Lodge, the extraordinary service and the very fine cuisine make it an exceptional occasion. 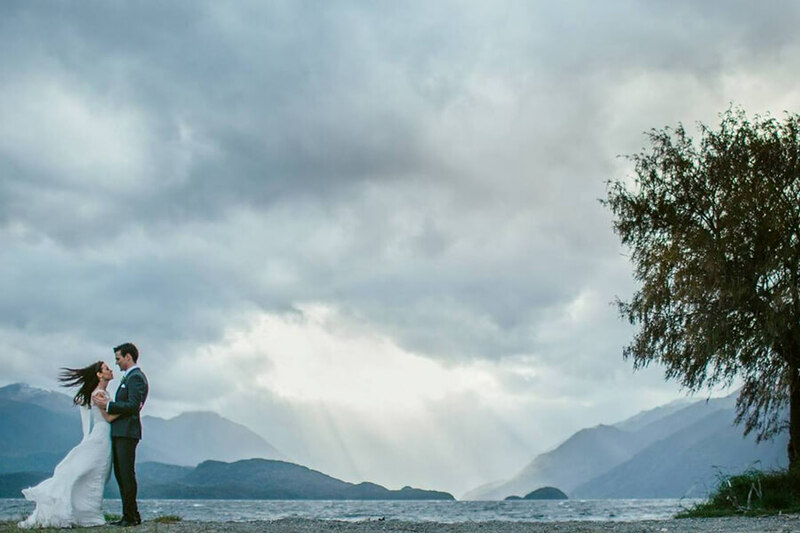 Fiordland Lodge is a property that creates an experience that is private, focused and of unmatched quality. 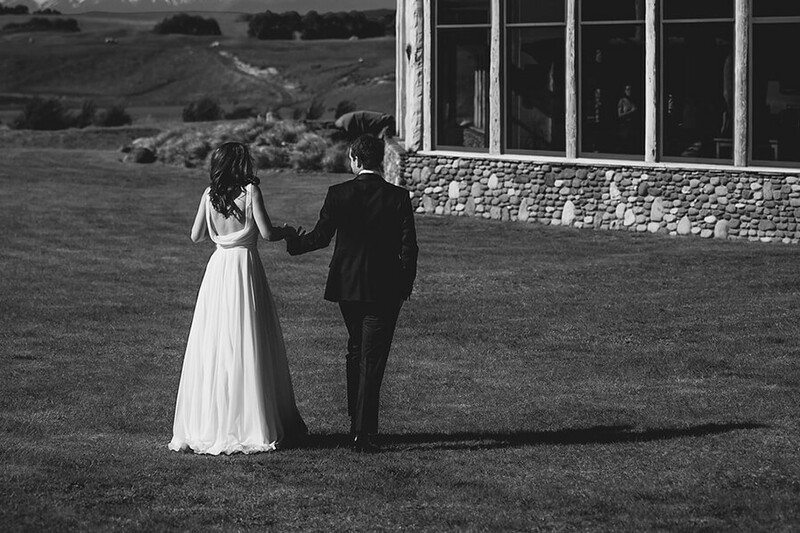 The main lodge is a remarkable building and transforms into the ultimate venue and has many special and distinctive attributes that contributes to a very unique property for hosting wedding receptions. 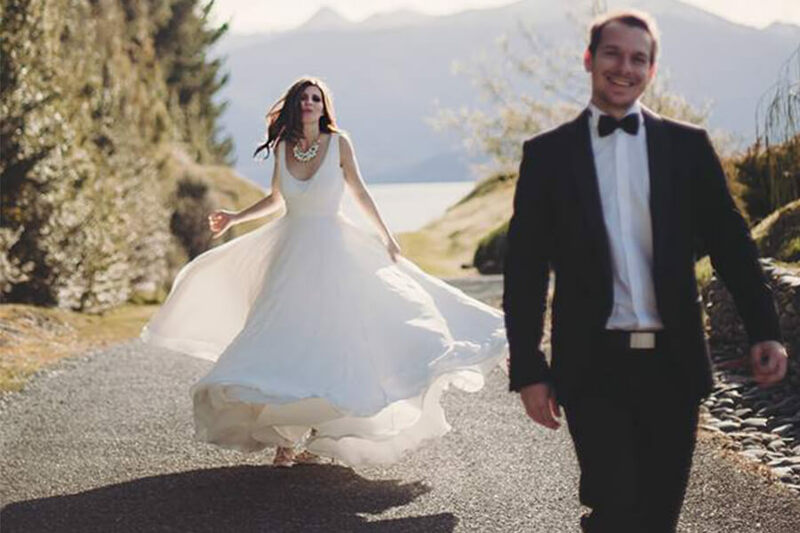 Our setting is a massive draw card as Fiordland Lodge is located near Queenstown in a World Heritage Area and offers the opportunity for a wedding in one of the world's most beautiful areas. 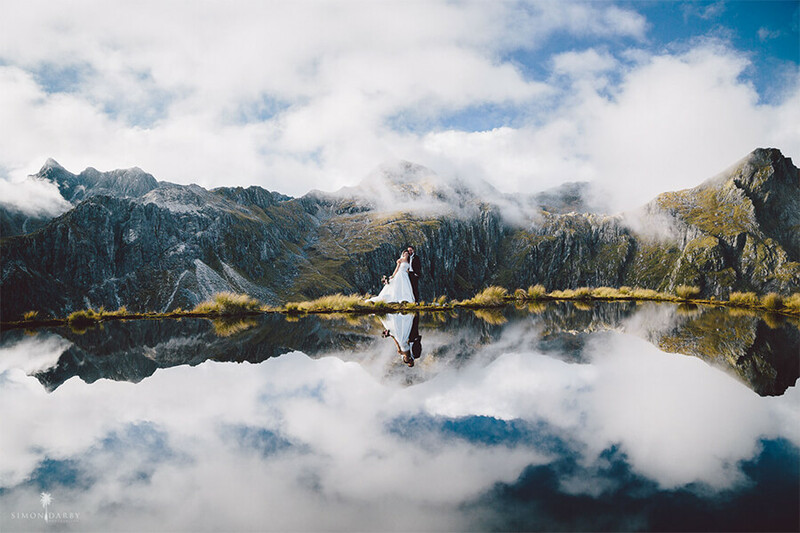 Across the lake from Fiordland Lodge to the west lie the mountains of the Fiordland National Park, a backdrop to your wedding reception unmatched and an area of over three million acres of untouched wilderness and part of the much larger South West New Zealand World Heritage Area. 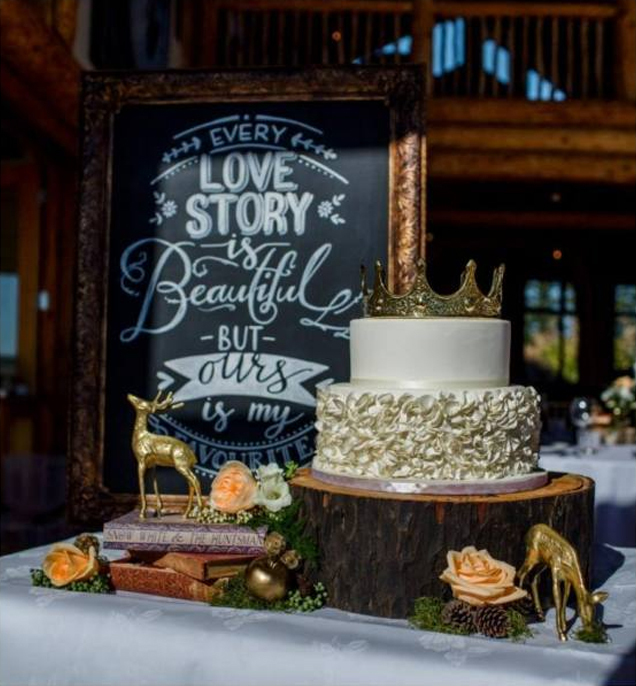 Your wedding reception will be held in the distinctively unique main lodge or "Great Room" and the log construction is very impressive with massive whole tree trunks supporting ceilings. A huge 11 metre floor to ceiling river stone fireplace is the centre feature of the lounge and the open fire is 2 meters across and to our knowledge the largest fireplace in New Zealand. The open architecture of Fiordland Lodge reflects the vastness of the Fiordland National Park and echoes of the forest are found in the striking natural timber construction. 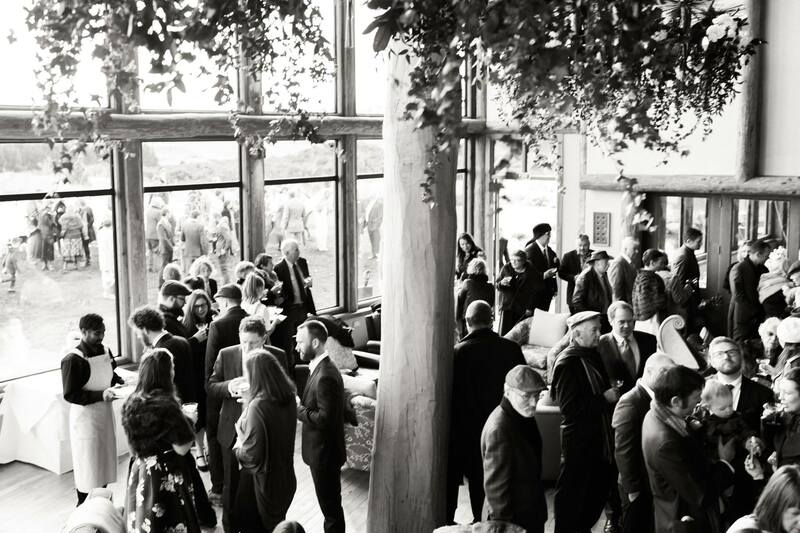 In the main lounge, a lattice work of huge log trusses soar to over 36 feet above and the bar top counters are huge fitches of rimu recovered from the ocean. Everything here is on a massive scale, including the views and handmade furniture. 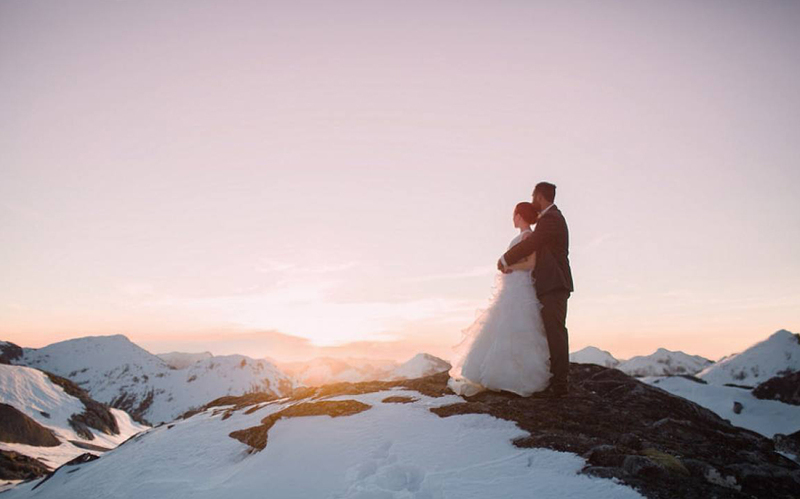 The special attributes of the lodge itself combined with the extraordinary food, service and setting creates a wedding experience that is private, focused and of unmatched venue quality. 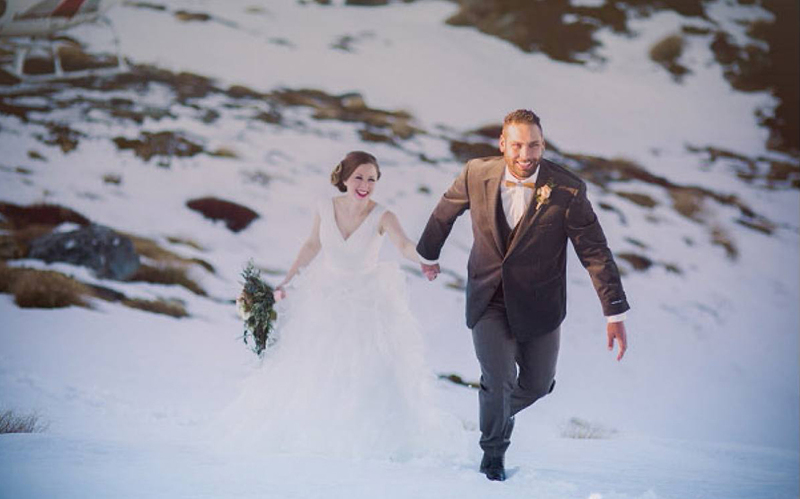 Once you have decided on Fiordland Lodge as your venue, your Wedding Coordinator and the Head Chef will work with you to plan the menu of your dreams. 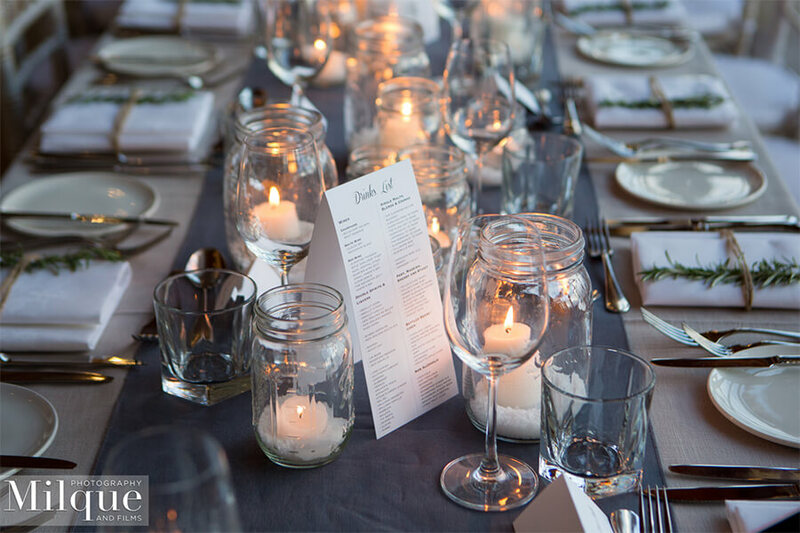 Reception Dinner Menus start from $100 per guest for a three course menu and special function menus are compiled in conjunction with the bridal couple to ensure a tailor made gourmet experience for each reception. 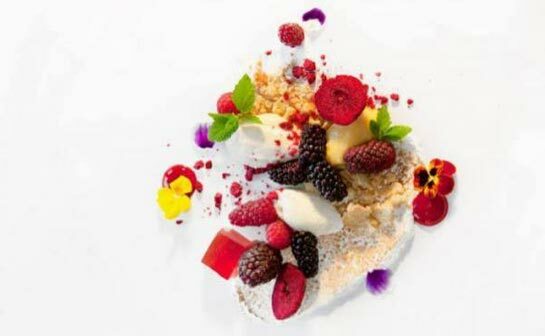 Fiordland Lodge offers a spectacular sweeping panorama of lake Te Anau and the surrounding Kepler and Murchison mountains providing a dramatic backdrop for savouring a melting pot of New Zealand cuisine. 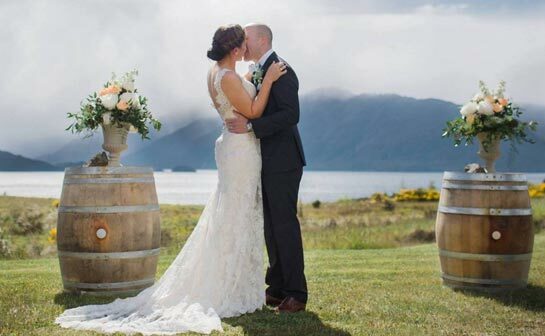 The enjoyment of food and wine is integral to the wedding experience on offer at Fiordland Lodge and the use of quality ingredients being seasonal and regional, and largely organic are fundamental to our cuisine philosophy. From classic cuisine to homely and comforting food, we can tailor a sumptuous menu, suitable for all religions and occasions. Our Head Chef will work with you to plan the perfect feast, skilfully prepared using the freshest, local, seasonal ingredients. 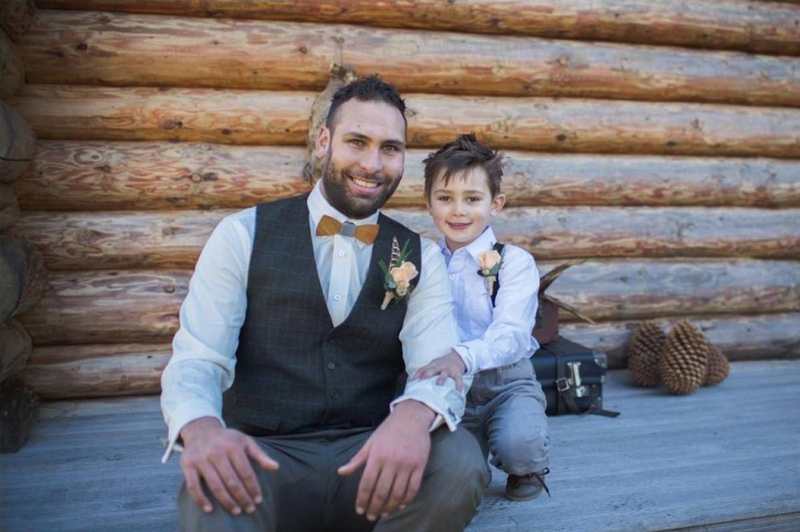 We also indulge exotic or eclectic tastes and offer advice on specific dietary requirements, tailor-made menus and also arrange child-friendly menus for the little ones. 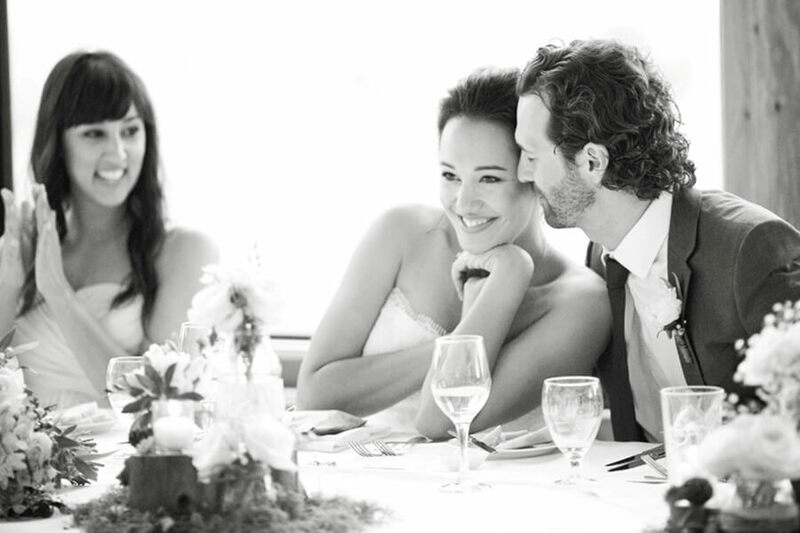 The wedding menu can take many forms, from a simple self-service buffet to an elaborate five course meal. 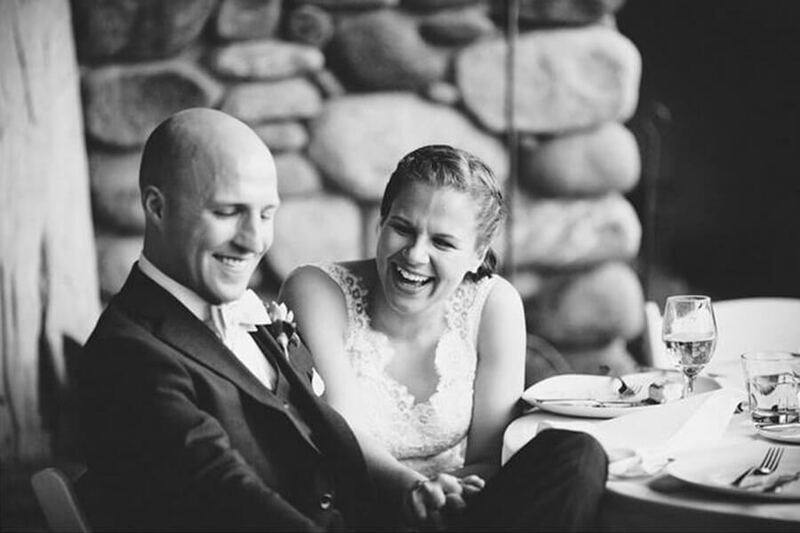 In the more traditional version, a seated dinner is generally preceded by canapes or hors d'oeuvres whilst the wedding party are having photos and contains three courses: a first course, a main entree, and a dessert. Please note that the below menu items are only a small representation of our repertoire and are provided merely as a guideline. It is our pleasure to customize the menus to reflect your individual style and taste. Sample Canape Ideas - Canapés are typically served with drinks, while photos are being taken between the ceremony and the wedding breakfast. Tomato and buffalo mozzarella tarts with Sicilian salsa. Brandy soaked figs stuffed with Windsor blue, wrapped in streaky bacon. Caramelized onion tart with rare beef and salsa verde. Marinated pork, kumara fritters and red apple salsa. Smoked salmon crostini with citrus crème fraiche. Starter Ideas - Please select ONE of the following options to Start your meal. Rare peppered Fiordland Venison with beetroot carpaccio, persian fetta, orange, vincotto. 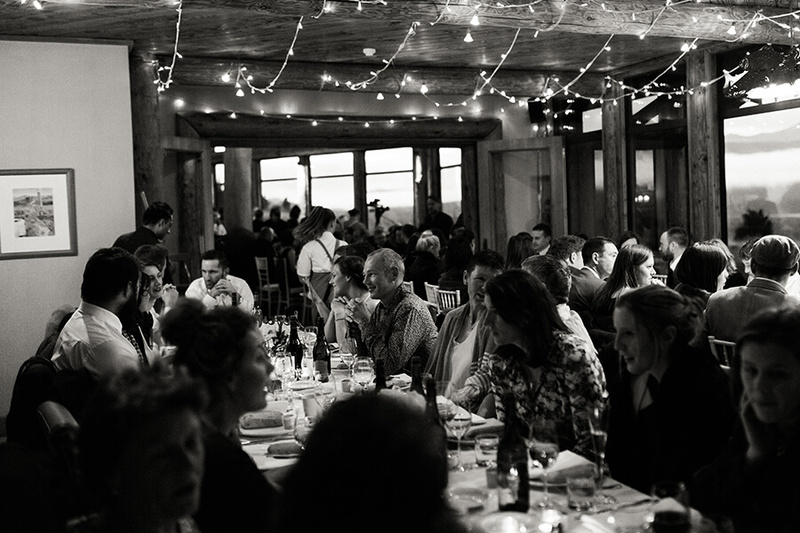 Fiordland Lodge Antipasto platters - Selection of cured meats, local cheese's, pickles and handmade breads on each table. Seared Nelson Scallops with cauliflower puree, white anchovies, potato wafers, micro herbs. 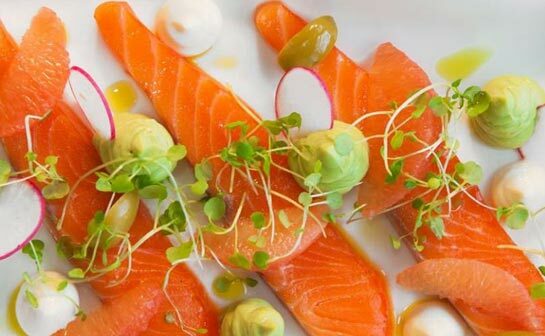 Sugar cured Akaroa Salmon with shaved fennel, avocado, tomato chilli ginger gel, citrus herb oil. Goats curd with verjuice poached pear, hazelnuts, currants, savoury tuilles. Twice cooked pork belly with sweet potato skordalia, spiced treacle, blue mayonaise, apple,baby cress. Sauteed gnocchi with white asparagus, poached farm egg, shaved pecorino. Light seafood bisque with poached Exmouth prawns. 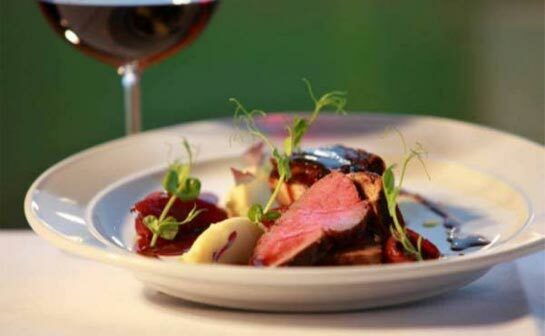 Main Course Ideas - Please select ONE of the following options for your main dish. Wakanui Beef fillet mignon, potato and black truffle pave', mushrooms sauteed in walnut oil,foie gras butter. Duo of Free range Pork rack, braised Lamb shoulder, ratatouille relish, garlic puree, choux potato and sweetbreads. Honey glazed confit Duck with pistachios, baked sweet potato, rhubarb and orange jelly,mulled red wine jus. Sous vide Southland Lamb tenderloin with creamy white polenta, fresh peas, persian fetta, mint,gremolata crumbed sweet breads, cabernet rosemary jus. Crispy skinned Akaroa Salmon with parsnip puree, seared scallops, cedar smoked sweet corn, herb oil. Roasted butternut pumpkin ravioli with fried quail egg, white beans, brussel sprouts, sage butter. Grilled Blue Cod with kumara croquettes, braised fennel, roasted vine tomato butter sauce. Wakanui Beef eye fillet with braised beef cheek, Paris mash, roasted eshallots. Seared Northland Kingfish, crispy pork, red pepper sweet corn and lime salsa, watercress and central otago olive oil. Fiordland Groper, braised beef cheek, heirloom tomato, crisp onion ring, salsa verde. Duck two ways, seared breast, confit leg, butternut flan, orange fennel and red grape salad. Seared Tuna, Lamb sweet breads, garlic mousseline, pickled celery and herb salad. Stewart Island Blue Cod, free range Pork Cheek, kumquat marmalade, cauliflower puree and mustard cress. Dessert Ideas - Please select ONE dessert option to end your meal. Morrocan mint tea sorbet with passion fruit jelly. Kaffir lime creme brulee with mango ice cream. Layered chocolate and hazelnut tart with vanilla marscapone, raspberry gel, hazelnut praline. Flourless lemon ricotta cake, orange syrup, vanilla bean and white chocolate icecream. Trio chocolate parfait, chocolate wafer, rosemary and orange foam. Dessert Petit Fours served with Wedding Cake - Lime and coconut meringue tart, Profiteroles filled with Tongan vanilla bean cream, Belgium chocolate macaroons with cointreau ganache. 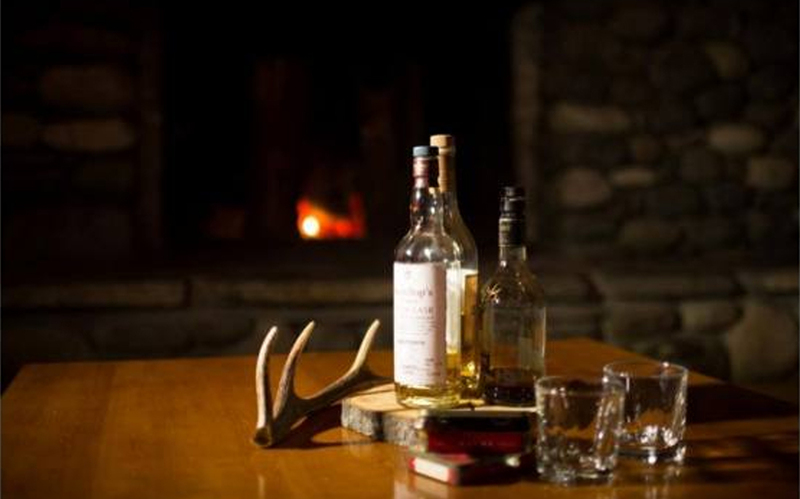 Our Fiordland Lodge wine list showcases the best that New Zealand has to offer. 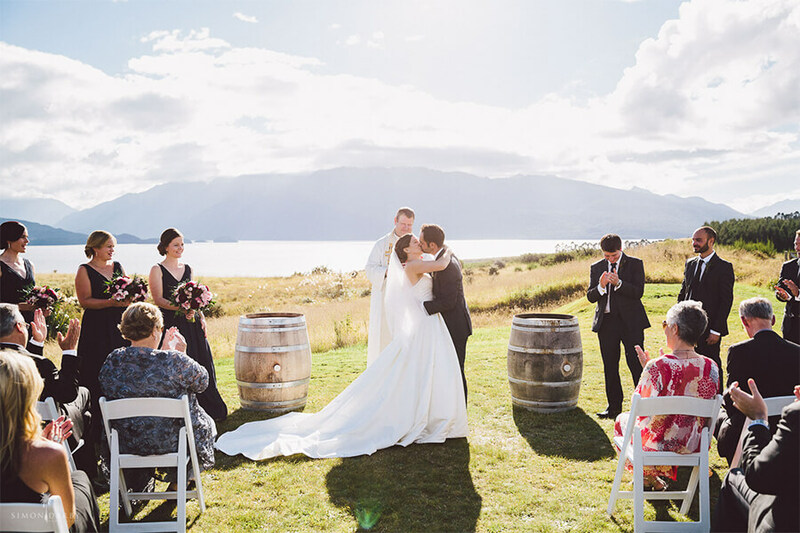 The highlights of the list are the wines from the Central Otago region renowned for producing world class burgundy as well as a wide range of other varietals in many unique and different styles. 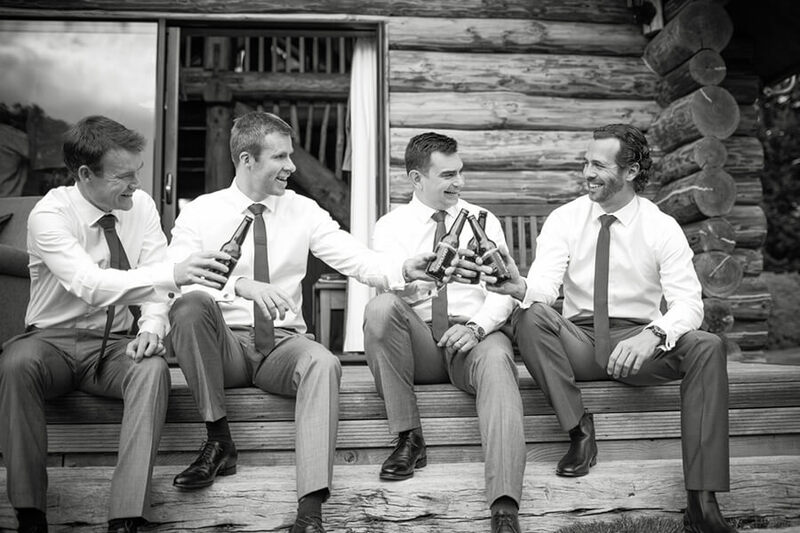 Fiordland Lodge has a full wine list and cellar to select from and we are fully licensed and can provide a complete range of beverage options. Through our direct relationships with wineries and wholesalers we can source a wide variety of beverages depending on the personal taste and budget of our clients. Does the Lodge offer corkage? 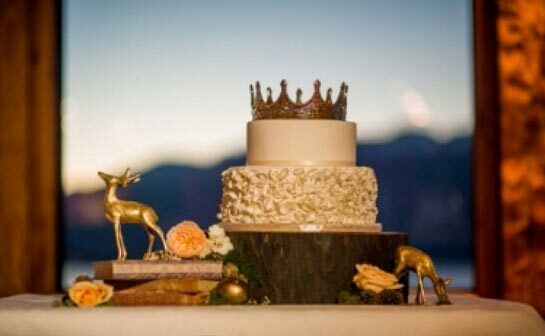 No, we do not permit food or beverages to be brought into the lodge with the exception of the wedding cake. At the discretion of the manager we may allow some champagne to be provided for toastings. 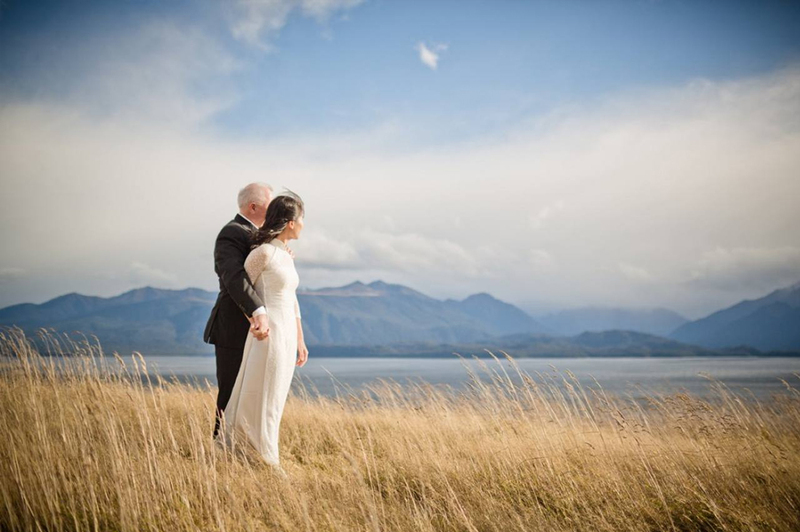 Fiordland Lodge has an Elopement Package designed for just the two of you to exchange your vows in our natural National Park setting with sweeping views of mountains and lake Te Anau. 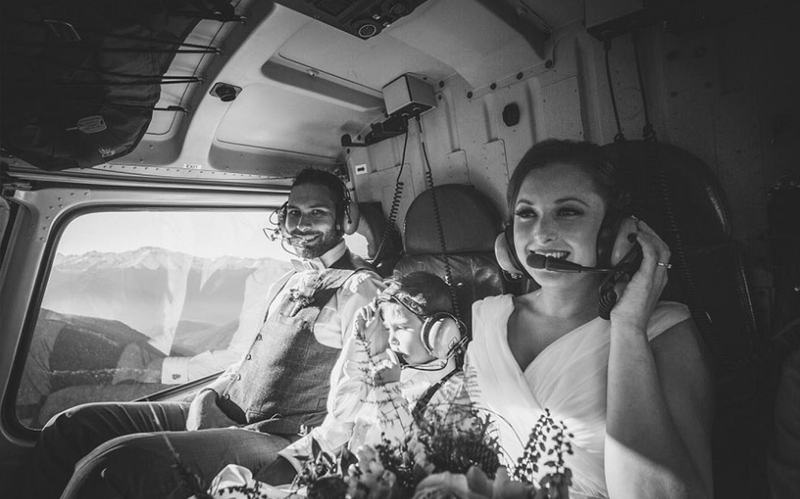 Every detail will be personally coordinated and our Elopement Package allows you and your fiancé the pleasure of savoring every element of a personalized and private wedding without the stress. 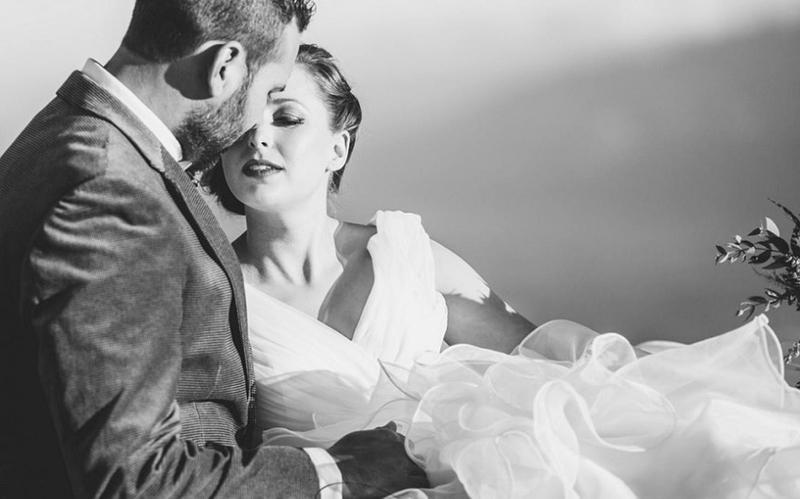 Our Elopement Package Includes:-Officiant arrangements - Ceremony in Great Room or outside - Candlelit four course dinner - Two witnesses to marriage ceremony - One night accommodation in our Executive Suite - Wedding night "Rose Petal" turn down. Contact Andy for pricing on +64 3 249 7832 or email info@fiordlandlodge.co.nz for more information. 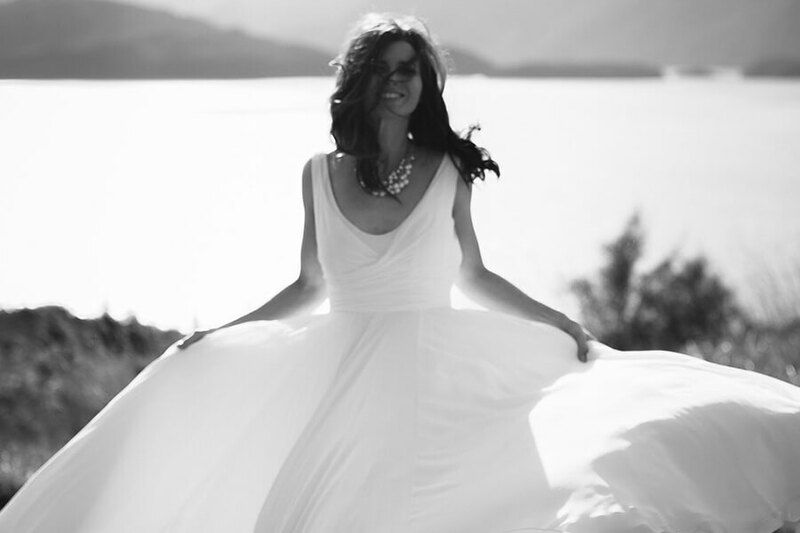 Petite Weddings are just like eloping, only with a few more of your friends and family in attendance for an amazing weekend somewhere fabulous! 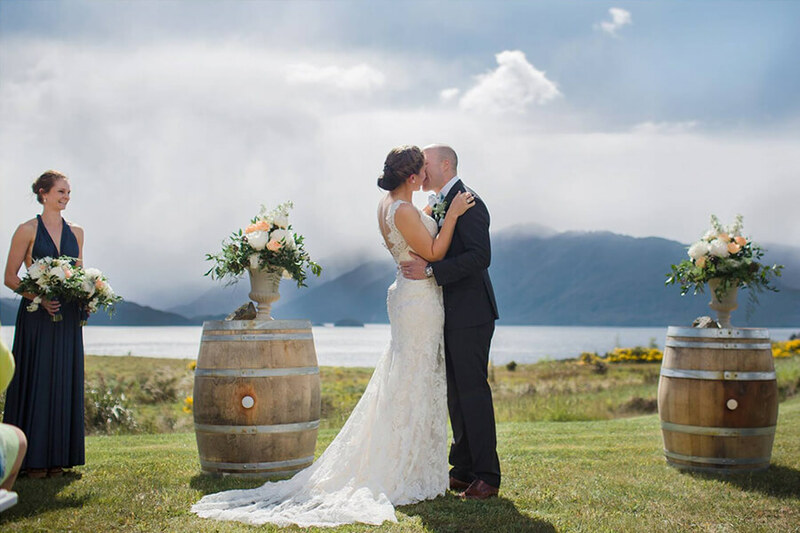 Offering a cosy atmosphere that is perfect for a wedding Fiordland Lodge has beautifully decorated rooms and the stunning location means that guests will not be disappointed when it comes to wedding photographs. 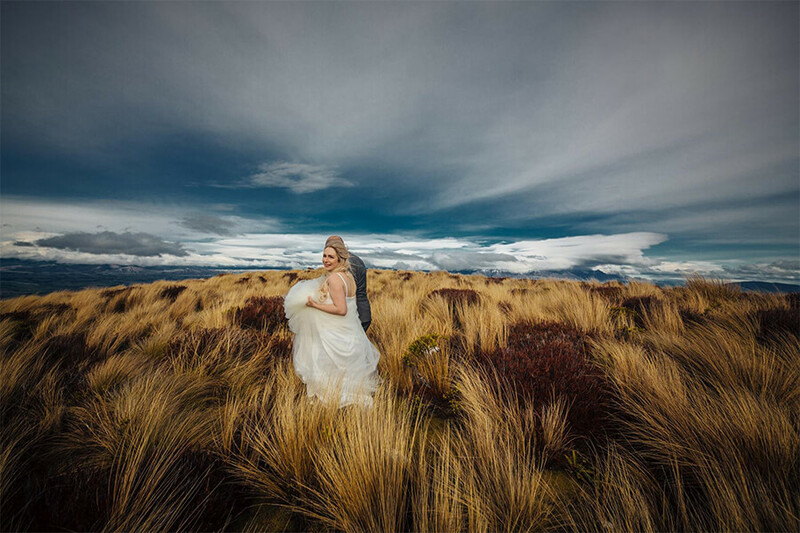 The setting is perfect for those who wish to make their wedding memorable and photographs that show the guests surrounded by stunning scenery of acres of untouched nature preservation land. 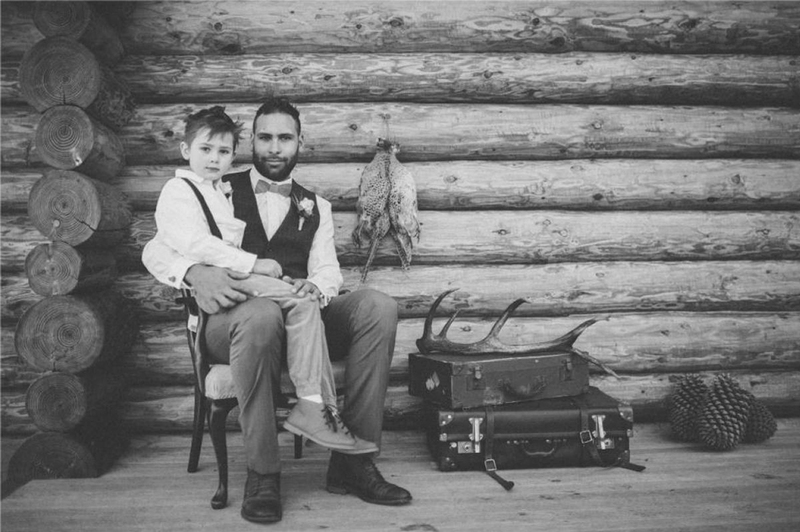 Our luxury lodge offers a variety of intimate wedding sites that creates a magical moment with just the closest of family and friends. 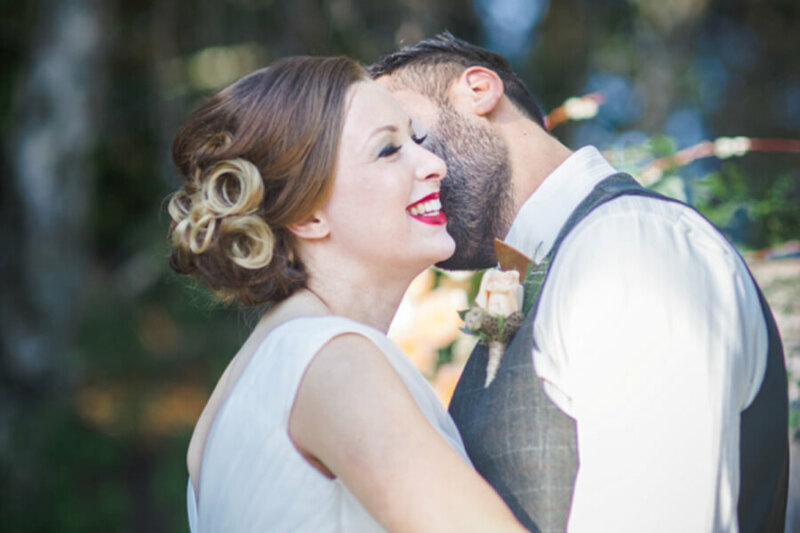 The Lodge is very private and ideal for the couple looking for the ease and stress-free experience of eloping, only with a few more people around to help celebrate. 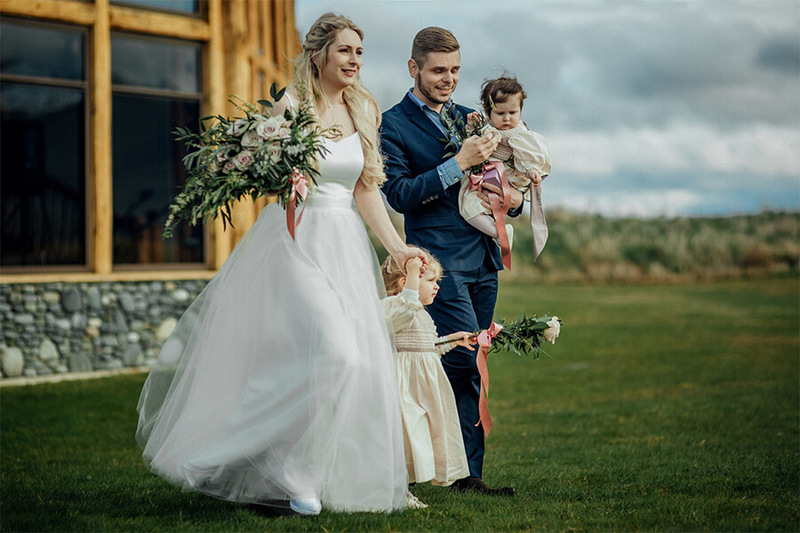 We can design a smaller wedding to suite all kinds and please contact Andy on +64 3 249 7832 or email on info@fiordlandlodge.co.nz for more details and to start planning your very special day. 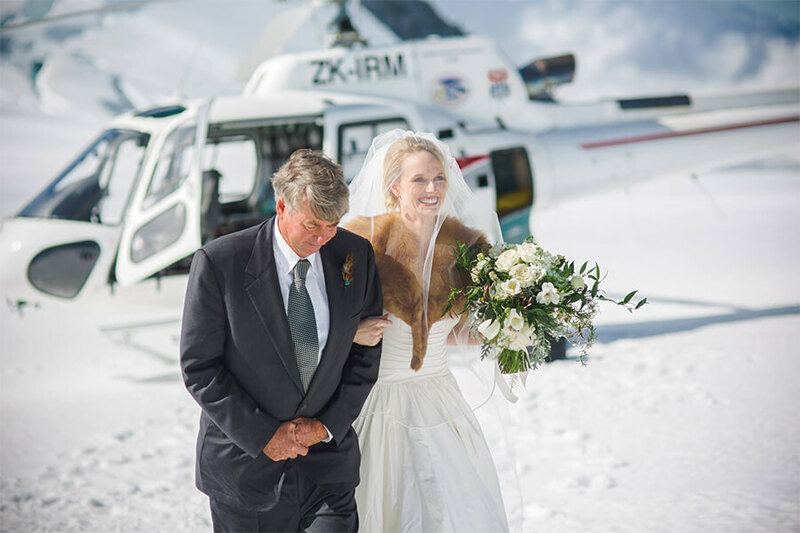 For an unforgettable alpine heli-wedding ceremony & sensational wedding photography, Fiordland Lodge can offer weddings exclusive landing rights in beautiful remote locations in the Fiordland National Park. 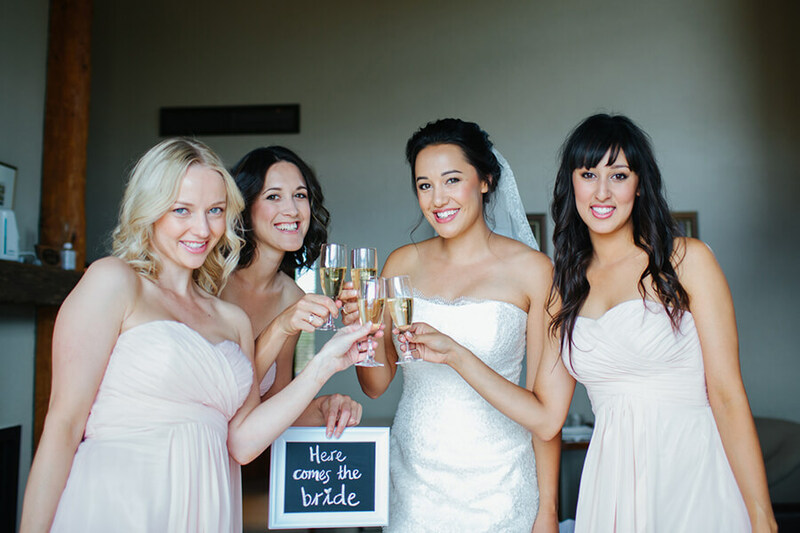 We can cater for just the bridal party for small and large groups. 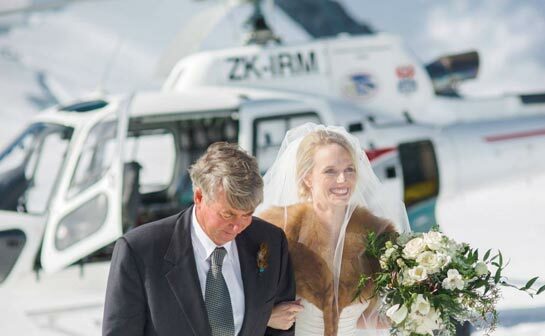 Fiordland Lodge offers many heli-wedding options that will make your special day truly unforgettable. 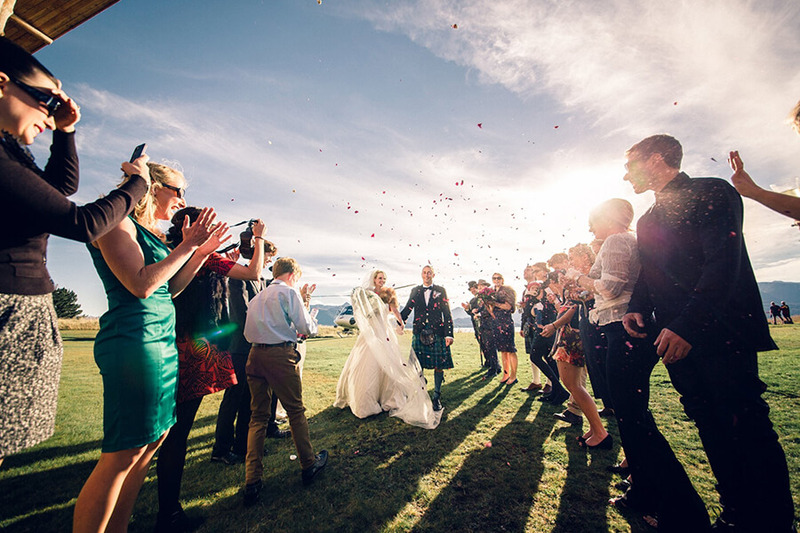 Direct from the lodge lawn, let us whisk you & your wedding party away to a special location guaranteed to provide the most stunning backdrop for your wedding. Flight Option 2: Mt Kidd: Departing from Fiordland Lodge, we overfly Lake Te Anau as you see the hidden wonders of our area unfold as you get a real feel for 'remote' Fiordland. Crossing over the main divide for ever changing scenery of beech forest mountain slopes, alpine lakes, waterfalls, hanging valleys and snow clad mountain tops. A landing is made at Mt Kidd a high alpine landing with dramatic views. 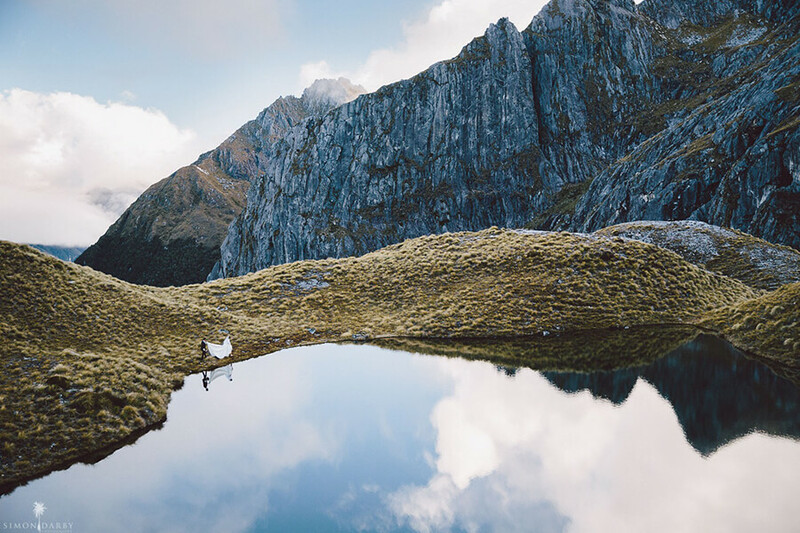 Mt Kidd has its own small lake and snow for around 11 months of the year, and sometimes our rare native bird the Kea may visit while you are there. Flight Option 3: Mt Titiroa: Departing from Fiordland Lodge, we fly over Lake Te Anau and Manapouri Township to land at Mt Titiroa. This location has unique sculptural limestone outcrops, small lakes and mountain vistas. 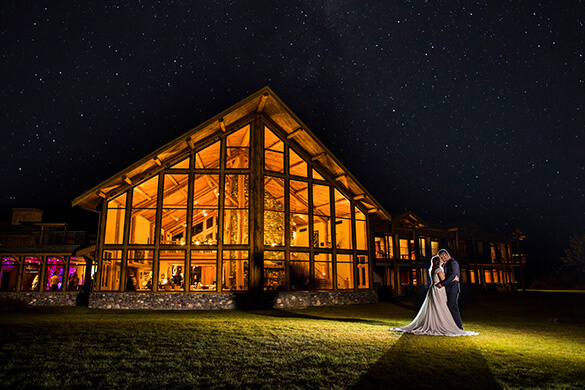 A wedding at Fiordland Lodge is the event of a lifetime. 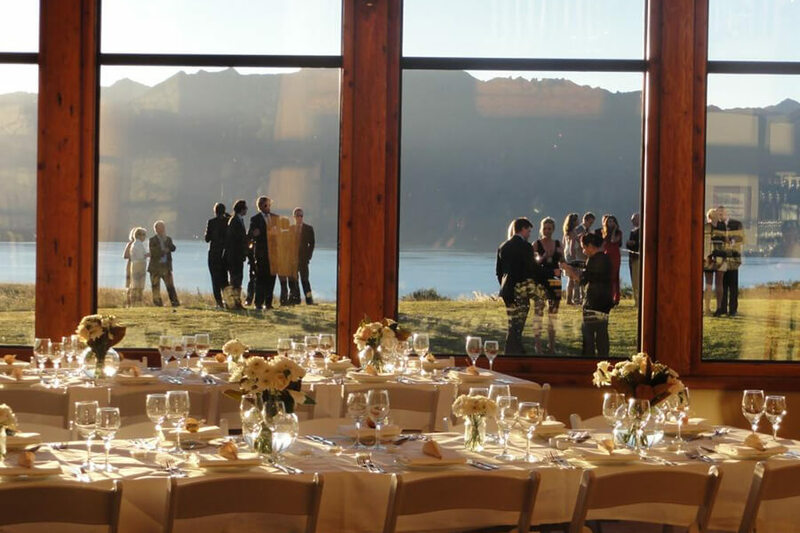 The Main Lodge is remarkable, offering the finest accommodations and dining in a truly idyllic setting on the edge of Lake Te Anau near Queenstown. 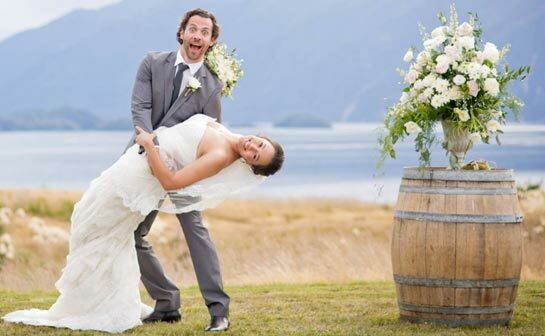 Postal: PO Box 196, Te Anau.